Those unsightly purplish-blue thin lines that seem to appear out of nowhere on our legs are varicose veins. They tend to be linked to the aging process, which is partially true, but they also can develop from hormonal changes and less than normal functioning valves. Men and women of all ages and races can be affected, with a higher percentage found in fair-skinned people. We have found natural treatments and home remedies for varicose veins that may help make them less visible, as well as prevent more from developing. Millions of dollars are spent every year on techniques and products attempting to rid or hide varicose veins. The market is flooded with lotions and creams, and many specialized laser surgery clinics have popped up in recent years. Here are some lifestyle tips, recipes, and natural techniques that may help with your varicose veins. Since varicose veins can appear with weakened vein walls from reduced blood circulation, regular exercise is key in preventing this. Even the smallest task of walking around can help, as prolonged standing or sitting with legs crossed puts a strain on your blood circulation. Exercise is also good for hormonal balance and maintaining blood pressure and a healthy body weight, all of which contribute to preventing varicose veins from developing. Try leg exercises such as side lunges, calf raises, leg lifts, and bicycle legs to improve vein durability. Avoid weight-bearing pressure exercises and try walking, cycling, and swimming. You may be able to prevent varicose veins from appearing by maintaining a healthy weight that is right for your body shape and activity level. Excess weight for your frame can place pressure onto the veins, causing the valves to become damaged. This inflammation can see varicose veins develop. Increase blood flow to and from the legs and calves with gentle massaging motions. 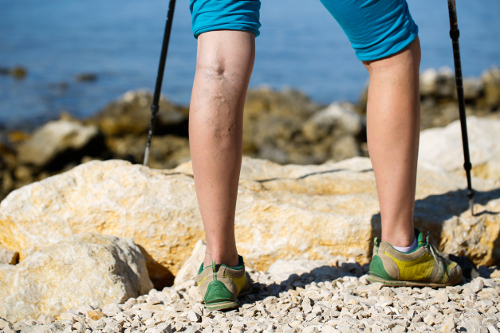 Varicose veins may surface as the weak veins begin to twist without proper blood flow. With gentle strokes, begin massaging the legs in an upward motion towards the heart to promote better blood circulation. You can also help this issue by keeping your legs slightly elevated when sitting or laying down. By adding firm pressure along the blood flow with the use of compression products, the strained veins return to normal shape. This method allows the circulation of blood to flow as it should. Compression socks or stockings are a popular varicose vein treatment and possibly a reversal tool. The natural healing properties and components of many essential oils may help to treat the symptoms of varicose veins, including their visibility. Cypress oil may improve circulation by using five drops on the site two times a day for several weeks. Helichrysum oil contains anesthetic and anticoagulant components to prevent blood clots when the veins are expanded. Use two to three drops directly to treat the painful and swollen area. Chamomile oil is one of the best treatments for relieving sore, tired legs from the effects of tense veins. It can be used as a massaging oil on legs before bedtime. Lavender and rosemary oils have anti-inflammatory properties to combat the symptoms. Soak a cloth in warm water. Add five to six drops of oil and place the cloth on affected area for several minutes. You can get the same benefits and more compared to compression stockings with the use of a mud pack treatment. The clay used may help shrink veins and reduce pain. It acts as a tightening vice to allow proper blood flow. Clay is also known to remove toxins from the blood vessels and skin. Apply a mud pack to the legs at bedtime. Rinse it off in the morning for the best results. We have natural anti-inflammatory tools right in our kitchens in the form of various foods and herbs. As they work to promote circulation, these products may prevent and reverse the effects of varicose veins. It is best to avoid the foods that cause poor blood flow and inflammation such as processed products containing trans-fats and high sodium, as well as caffeine-induced drinks and snacks. Fiber: Consuming 30 to 40 grams of high-fiber foods on a daily basis helps to prevent digestive issues such as bloating, which can add pressure on veins. Eat vegetables, fruits, ancient grains, flaxseeds, chia seeds, and legumes. Antioxidants: Adding antioxidants such as Vitamin C and E can help to combat inflammation, improve the durability of the veins, and prevent blood clots. Eat citrus fruits and berries, as well as green veggies to get the most benefit. Diuretics: We use diuretic products that increase fluid excretion to reduce swelling caused by water retention. Natural diuretics are dandelion greens, celery, and cucumbers, as well as herbs like basil, cilantro, and parsley. Spices: The natural properties of spices such as cayenne pepper promote blood flow while alleviating pain and inflammation. Drink a solution of one teaspoon of cayenne pepper and hot water three times each day. Another varicose veins natural treatment, apple cider vinegar is thought to be one of the best home remedies. This anti-inflammatory promotes blood circulation and decreases swelling, making varicose veins less visible. You can achieve this by massaging the cider directly on the veins twice a day for three months. You may also want to drink a solution twice a day. Simply mix water and two teaspoons of apple cider vinegar. Another inflammatory fighter is olive oil. Heat the oil and vitamin E together in equal portions, and apply it to the varicose veins in a circular motion for several minutes. Repeat this twice each day for two months. You can also combine four drops of cypress oil and two teaspoons of heated olive oil for a massage solution. Garlic helps destroy toxins in the bloodstream while boosting circulation by targeting inflammation. In addition to using garlic as a garnish, you can create a massaging solution to be applied daily to varicose veins. Place six chopped garlic cloves in a glass jar with the freshly squeezed juice of three oranges. Add two tablespoons of olive oil and let it sit for 12 hours. Shake the solution and massage a few drops onto the veins for 15 minutes. Then wrap the area with a cotton cloth for overnight treatment. This traditional herbal remedy contains several properties that have been used to target inflammation, pain, and other symptoms associated with varicose veins. It works as an astringent by tightening the expanded veins from inflammation. Apply a cloth dipped in witch hazel to the varicose veins for up to two months. You can also add 10 to 20 drops of the oil to a tub of warm water and soak your legs for 15 minutes. Repeat this once a day for two months. Marigold flower may be another natural treatment for varicose veins, orally or topically. Add a few of the petals of this flower to salads or eat alone. You can also apply it directly to the varicose veins to boost circulation. Boil a solution of four cups of water and one cup of the flowers for five minutes. While still warm, place a solution-soaked cloth on the veins until it cools. Repeat several times each day until the varicose veins become less visible. By using grape seed oil as a massage oil, you can target inflammation, increase blood circulation, repair damaged blood vessels, and strengthen veins. Combine three teaspoons of grape seed oil and jojoba oil with eight drops of an essential oil such as peppermint or lemon. Warm the oil mixture in your hands by rubbing them together before applying it to the varicose veins. Massage it using an upward motion. Similar to grape seed oil, pine bark contains antioxidants to boost blood circulation while it reduces inflammation. It can also strengthen the veins as it works with the collagen within the vessel walls. Simply create a solution with fresh pine tree bark and 12 cups of water. First, wash some pine bark and add it, while still wet, to a pot of eight cups of boiling water. Then, cover the pot and let it simmer until half of the water evaporates. Transfer the remaining water to a large bowl. Add the other four cups of water to the bark still in the pot. Simmer it again until half of the water remains. Using a cheesecloth, strain the liquid into the bowl of boiled water. Pour this combination back into the pot to simmer until a quarter cup of the solution remains. Once cooled, you can store the mixture for use. Varicose veins were once considered blemishes that needed to be covered up and not seen. We now have the ability to diminish their appearance, reverse the lines, and even prevent the veins from developing. If you are not inclined to have laser surgery or an invasive surgery to correct varicose veins, there are lifestyle changes and home remedies to treat varicose veins. “Home Remedies for Varicose Veins,” Top 10 Home Remedies; http://www.top10homeremedies.com/home-remedies/home-remedies-varicose-veins.html, last accessed April 27, 2017.